Johann Benedict Listing (25 July 1808 – 24 December 1882) was a German mathematician. J. B. Listing was born in Frankfurt and died in Göttingen. He first introduced the term "topology", in a famous article published in 1847, although he had used the term in correspondence some years earlier. 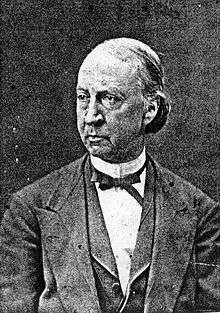 He (independently) discovered the properties of the half-twisted strip at the same time (1858) as August Ferdinand Möbius, and went further in exploring the properties of strips with higher-order twists (paradromic rings). He discovered topological invariants which came to be called Listing numbers. In ophthalmology, Listing's law describes an essential element of extraocular eye muscle coordination. O'Connor, John J.; Robertson, Edmund F., "Johann Benedict Listing", MacTutor History of Mathematics archive, University of St Andrews . A reprint of (part of) his famous 1847 article introducing Topology, published in Vorstudien zur Topologie, Vandenhoeck und Ruprecht, Göttingen, pp. 67, 1848. ↑ Peirce, C. S., 1992, Reasoning and the Logic of Things: The Cambridge Conference Lectures of 1898, edited with introduction by Kenneth Laine Ketner and with commentary by Hilary Putnam, who discusses Listing numbers starting on page 99. It is currently difficult to find anything online about Listing numbers except in connection with Peirce.